Thanks to you, Chase went to the dance! | Highfields, Inc. 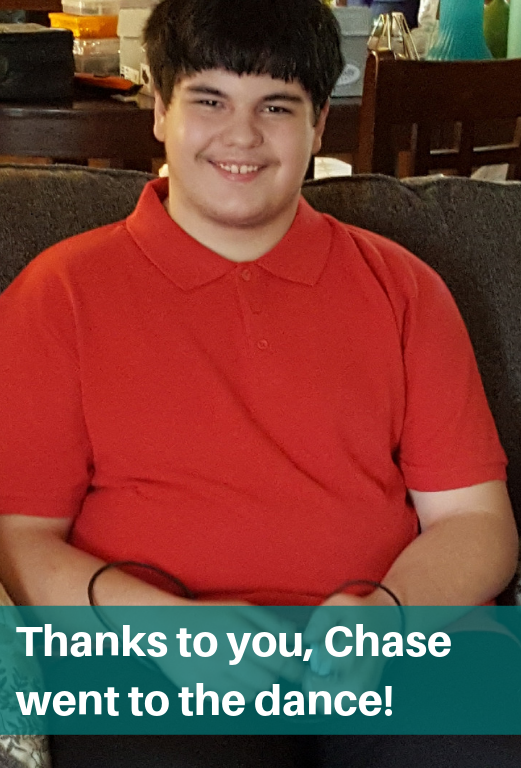 Thanks to you, Chase went to the dance! Chase was diagnosed with Attention Deficit Disorder at a young age, and later on with Autism Spectrum Disorder. He has had difficulty learning in a normal school setting and coming from a single-parent home he has only his mom, Laura, for family support. Laura is unable to work due to health problems, and finances are a problem. Together they are involved in Highfields’ Home-Based Therapy program to help overcome their challenges. Chase and Laura have both suffered trauma and abuse of some form. They are working with Highfields to process this trauma and learn effective coping skills to deal with their emotions related to this. They are also working to get Chase the services to address his Autism, and the skills training he could benefit from to prepare him for his future. Chase has trouble fitting in socially with his peers at school, so when he asked his mom if he could go to the Homecoming dance last year, she didn’t want to discourage him, but he didn’t have the appropriate semi-formal clothing. Thanks to the support of special donors, they were able to buy clothing and shoes, and gas money to drive Chase to and from the event. “Thank you so much for helping Chase attend the dance!” said Laura.